How do you feel when you see beautiful models flaunting their long and glossy tresses? Do you feel that your hair is not shiny, healthy and resilient enough? And then you quietly wish that you too have hair like them. In this article we are going to tell you about aloe vera, a miracle natural ingredient that can help you to have beautiful hair like them. Don’t worry you will not need to buy expensive hair care products from the market. Is Aloe Vera Good For Hair ? Most of you know that aloe vera is commonly used as a moisturizer for skin because it can help trap and lock in moisture. But what about aloe vera in hair? So, apart from providing a host of health and skincare benefits, a few leaves of aloe vera can even save the beauty of your hair when used regularly. Many hair products available on the market claim to treat most of the hair problems, but when you look at their label you will find aloe vera as one of the main ingredients. Whereas such products of good quality are too expensive to buy and on the other hand the cheaper local variants with aloe vera contain chemicals and preservatives, which would not improve your hair conditions, rather they may damage it. We recommend that instead of buying hair products containing aloe vera from the market, you use aloe vera for hair in its natural form. Aloe vera gel can be purchased from many stores — especially health food outlets or better is to extract and use the natural aloe vera gel from your terrace or garden plant. You can collect some aloe vera leaves from a garden and treat your hair problems naturally. (i) Adds strength and luster to hair. (iii) Easily penetrates scalp and hair. (iv) Maintains the hair hydrated by locking moisture in hair. It works as barricade between hair and environment. (v) Helps to maintain the pH balance of the hair. (vii) Lessens scalp redness and inflammation. (viii) Its anti-fungal properties help in controlling dandruff. (ix) It solves itchy scalp problem. How To Use Aloe Vera For Hair ? The best way to use aloe vera gel is on its own in natural form or with other natural ingredients, such as honey, vinegar, lemon juice to make hair soft, clear and conditioned. You can also mix it with other hair products for hair application and various home remedies. (i) Simple Aloe Vera Homemade Conditioner: Using aloe vera as a hair conditioner leaves your hair smooth and velvety soft. Cut an aloe vera and extract the gel with a spoon or scooper. Apply the gel on damp hair using your fingers, starting from scalp till the hair ends. Wrap the hair in a warm towel. Wait for 15 minutes for the gel to sink in. Wash your hair with a mild herbal shampoo. (ii) Aloe Vera Leave in Conditioner Recipe: Aloe Vera has pH of 4.5 that aids in closing hair cuticles to help in controlling hair frizz. Take aloe vera gel and water in equal parts and mix them together thoroughly in a small bowl. Transfer this solution into a spray bottle and shake it gently. Add in a few drops (3 to 5) of an essential oil of your choice and shake it again. You can spray it on your hair when you feel it to be unmanageable. Aloe Vera juice is very light on hair, unlike other hair conditioners that make you feel as if your head is weighed down. It acts as humectant, so it attracts moisture from air and maintains your hair hydrated. That’s why it works as a hair serum and control frizz effectively. Try using this leave in conditioner after styling your hair instead of using a readymade hairspray. (iii) Aloe Vera And Olive Oil Deep-Clean Conditioner: Mix together thoroughly equal parts of aloe vera gel and olive oil. Comb this mixture through your hair, leaving it in for about 30 minutes. Wash it off with a mild shampoo. (iv) Aloe Vera And Lemon Juice Hair Conditioner: Mix one-quarter cup of aloe vera gel with the juice from half of a lemon. Add in 3 to 5 drops of your favorite essential oil. Shampoo your hair as usual, and then apply this mixture to the shampooed hair. Wait for 3-5 minutes and then rinse your hair. (v) Aloe Vera And Egg Conditioner: Take enough aloe vera gel and mix one egg with it. Apply this conditioning mask onto your hair, leaving it there for about 15 minutes and then wash your hair. This will make your hair healthy and look beautiful. 2. Pre-Shampoo Aloe Vera Hair Treatment: Apply aloe vera gel in your hair before shampooing your hair to exterminate dandruff buildup in the hair. Aloe vera contains natural cleansing enzymes that are considered to be one of the best to get rid of dead skin flakes, fungus & dandruff and clearing extra oils from hair effectively. It also keeps the hair hydrated and maintains the pH balance of scalp and averts recurring of dandruff. (i) Massage aloe vera gel onto your scalp, leaving it in for about 10 minutes. Wash your hair with your favorite shampoo. (ii) Mix a few drops of lemon juice with aloe vera gel and apply it to your hair. Using your fingers spread this mixture all over your scalp, leaving it there for about 10 minutes. Wash your hair thoroughly with warm water. This is an effective natural treatment better than using chemicals shampoo on your hair. Tip: If you like to have a relatively lighter pre-shampoo treatment then you can mix aloe vera gel with coconut milk and few drops of wheat germ oil. 3. Aloe Vera Shampoo: A simple way to make it at home is to take 1 tablespoon of aloe vera gel and mix it thoroughly with 8 ounces of your favorite shampoo. Shampoo your hair as you would do normally. 4. Aloe Vera For Hair Loss Treatment: Nursing hair with aloe vera for treating hair loss is an ancient home remedy used by the Egyptian for hair growth and clearing dirt and oils from hair. For men who are balding and women who are going through big hair loss problem, aloe vera treatment is a good choice. It has lots of enzymes and anti-oxidants that are very useful for repairing damaged hair and stimulating hair follicle to promote hair growth. 5. Aloe Vera For Hair Growth: Aloe vera is full of enzymes that directly stimulate hair growth. These protelitic enzymes help to remove dead skin cells from the scalp that clog the pores and hair follicles, not allowing for proper penetration of nutrients in the hair. By opening the hair follicles, nutrients can easily penetrate the hair, allowing for hair growth. Also, its alkalizing qualities can help in restoring the scalp and hair’s pH to a more desirable level, leading to enhanced hair growth, while causing the hair to retain water and moisture. 6. Aloe Vera To Get Rid Of Greasy And Oily Hair: Like dandruff aloe vera juice also helps in getting rid of greasy hair and treating your oily hair problems. The process is same as explained for getting rid of dandruff. You simply have to add a few lemon drops to aloe vera gel and apply onto your hair to cleanse it. 7. Aloe Vera To Nourish Hair: Aloe Vera is very rich in vitamins, minerals and enzymes that make it one of the best natural products to nourish hair. Messaging its gel onto hair once a week strengthens hair roots, promotes hair growth, removes dandruff & grease from hair and makes hair over all healthy and strong. Besides all these benefits, it has properties, which can treat dry hair and itching problem. Its use can remedy almost all hair related problems. 8. Dandruff Cure Serum: To get rid of dandruff flakes from your scalp, add few drops of tea tree oil to aloe vera gel. To get a serum type consistency, mix in two teaspoons of rose water, and stir this mixture well. Using your clean fingers, cover your scalp with this serum and let it penetrate for one hour before washing it off. Use this natural remedy once or twice a week. 9. Aloe Vera For Getting Rid Of Itchy Scalp: Aloe vera’s anti-bacterial, anti-fungal and anti-septic properties make it a right choice for curing itchy scalp. It bestows calming and cooling sensation to scalp and therefore can be used to treat sunburns on scalp. To treat your scalp problems, you just have remove gel from an aloe vera leaf and apply it directly to your hair and spread it onto your scalp using your fingers. Leave it there for about 20 minutes. This works as a good home remedy for curing infections on scalp, nourishing your hair at the same time. 10. Style Your Hair: Instead of using readymade serums, you can use aloe vera as a styling product. You just need to add a small amount of aloe vera gel to your hair after styling it, to provide natural shine to your hair and help lock in moisture. Take a small amount (penny-sized dollop) in your hands, and then distribute it evenly over your hair. 11. Aloe Vera Overnight Hair Treatment: Is your hair exceedingly dry and damaged? Is your hair difficult to manage? Try this aloe vera hair mask to solve your hair problems. Method: Extract half a cup of fresh aloe vera juice from aloe plant. Add two teaspoons of castor oil, two teaspoons of powdered fenugreek and one teaspoon of basil powder in it. Mix these all ingredients thoroughly; you can also blend these in a blender to form a thick, smooth hair mask for easy application. Apply the mixture on your roots and strands. Cover your head with a shower cap and keep it overnight so that the hair-mask can penetrate deeply. Wash it off in morning thoroughly using a mild shampoo. This hair mask is very effective in conditioning hair, removing dandruff, nourishing and promoting hair growth. Use this mask once a week to make your hair thick, strong, healthy and lustrous!! (i) Strain the aloe vera jelly before applying it to your hair. Make sure that all white sediments and the green exterior are removed while straining. Otherwise, residues will remain on your hair and attract dirt and grime leading to dandruff. 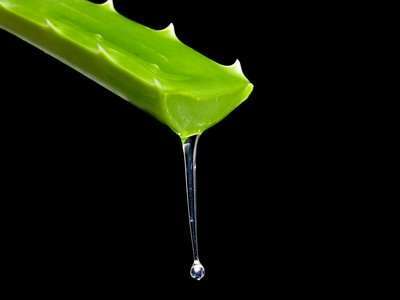 (ii) Aloe vera gel is thick, so takes time to strain. Make aloe vera paste beforehand and let it to strain, when it is ready to use. Very interesting! I’ve never tried aloe vera on my hair. Aloe Vera is being used for hair since ancient time. It’s a great natural product to solve many hair problems..
Can we get back our hair from aloe beers? I don’t think you can regrow all the hair once gone. hello sister thanks for the useful tips. can i use oil after applied aloe vera gel in to head? You can mix aloe vera juice or gel with oil and massage gently the mixture onto your scalp and hair…..
hi, very nice info. What is the best way to get rid of premature white hair and can i use aloe vera gel to acheive this…. These remedies will also help in getting rid of some of your already turned white hair. May I know if the aloe Vera gel which is consumed orally contributes to hair growth? Consuming aloe vera generally is good for your health. However, its oral consumption won’t contribute directly for hair growth as such. But aloe vera gel taken out directly from aloe vera plant’s leaves and applied directly onto your hair is definitely good for hair health and hair growth. Try these for 3-4 weeks. If you don’t see any improvement, I suggest you consult a good dermatologist / physicion as there could be some underlying medical cause for your falling hair. wonderful article.. love aloe vera. just made aloe and coconut shampoo bars.. I think I’m gonna try Aloe Vera..
Today i brought aleo vera gel from patanjali store after reading online about its benifits regarding hairfall . I m getting bald patches and overall density of my hair has reduced considerably.what i want to know is, can the same gel brought for pigmentation control be applied for hairloss and whether it will get me back my lost hairs ,and how long will it take me to see visible results ? Regarding the aloe vera gel you bought from Patanjali, read the label on the bottel / container – it must be mentined there what for you can use the gel. If you are having / getting bal patches at different places, then it could be due to alopecia, also known as spot baldness. It is an autoimmune disease in which hair is lost from some or all areas of the body, usually from the scalp due to the body’s failure to recognize “self” and destroys its own tissue as if it were an invader. Often it causes bald spots on the scalp, especially in the first stages. In 1–2% of cases, the condition can spread to the entire scalp or other body parts haiving hair. If such is the case, I would suggest that you consult a physicion, hair specialist or a homeppathic doctor. i want to grow my hair longer so will it help to some extent? You can use these remedies for getting healthy hair. Here are some specific natural remedies to grow your hair longer. Hi .. recently due to lot of hair fall and sudden dandruff problem i have started using the Fruit of the Earth 100 % aloe vera gel product on my hair .. thought it did not specifically mention that it can be used for hair … I still gave it a try .. do you think its safe to use this ? do you know of any good pure aloe vera gel products that can be used on hair ? 2 If I donot wash them they become oily and week again. I was frustrated because I was blovked from both the sides. One month back I read many articles on aloevera, this is one of them. I am using aloe vera for a month now and its working good for me till now. When I apply gel hair get conditioned and it soaks extra oil as well. And most important benefit in hair loss. Only thing now bothers me is it leaves some white particles behind, can you suggest something for this. Glad to know that aloe vera gel is working well on your hair. Mix some water with the aloe vera gel and churn the mixture thoroughly in a blender. Strain the mixture through a tea strainer and use the sieved liquid to apply onto your hair. I am only 16 years old and my many hair falls every day.. one part of my head is getting bald… i think my root hair is so weak … what can i do? You seem to be suffering from alopecia. I suggest you consult a good dermatologist or a hoeopathic doctor. Homeopathy does have good treatments for alopecia. Thank you so much for appreciation……. can I use aloe vera instead of other chemical gel… any side effect..? I am having a lot of problems with my hairs.My hair as become dull,Splitted and cut too because of dull and over comb on dull and damaged hair i guess. 1) what kind of shampoo i can use and also suggest me some good shampoo names….? (currently i am using panteen for my hairs). (i) Dove Intense Repair Therapy Shampoo: This shampoo from Dove is a treat for dry and damaged hair. It claims to tackle all the problems that come with dryness, and as per the reviews, fulfills most of the claims as well. It contains borago officinalis seed oil, and provides nourishment and moisturization, tackles split-ends and repairs the damage. To top it all, it has a formula that doesn’t weigh down your hair, and all that at a price that fits your budget. This one is a must pick to tackle the dryness scare. Just by applying aloe vera 1 hour before shampooing my hair can it stop hairfall?? Im suffering hairfall for a year. Now i have only a few hair .im just 18 im so… Worry about it and cannot concentrate on my studies what shoud i do , can aloe vera makes to stop my hairfall and it can regrowth? Considering your conditions, I would recommend that you consult a good dermatologist / hair specialist……. How long can one preserve aloe vera mixed with water solution and essential oil ( coconut oil ) for spraying it on hair and face In a plastic spray bottle. And can you suggest some signs that indicate aloe vera has gone bad or expired. You can keep this concoction in an air-tight plastic spray bottle in cool, dark place for a month. The moment it starts smelling bad through it away and make a fresh one. MAY I KNOW THE WHY ALOE VERA HELPS IN GROWING HAIR FASTER?? There are certain things that can help your hair grow healthier, which results in less breakage and lets your hair to get longer (aloe vera is one of them that works effectively). Another thing is hair has a certain length that it can grow just like every other hair on your body. Genetically some people can grow their hair down to their hips and some can only grow down to their shoulders. I am 20 years old.I am suffering for hairfall,so now have a few hair.And my scalp is always hot.So what do i do to reduce hairfall? Can I use anything to promote hair growth? And something to thicken fine hair? Please any advice. Thank you kindly. I am facing extreme dandruff problem… time to time dandruff on my scalp worrying me.Plz…. suggest good aloevera based shampoo or any herbal shampoo which i can use……. 2. Although, I have never used this shampoo – but Pukhraj Aloe Vera Shampoo is claimed to be a pure herbal shampoo with anti-dandruff, anti-breakage and anti-allergic properties. You can try this shampoo and share your experience with us. Nice post dear. Can I use aloe vera hel after applying oil on my hair? I am an African my natural hair is breaking and dandruff is part of my major challenges. I read about aloe vera plant and how it can stop hair breakage I will try to use the plant I just pray it works for my hair. I am an African woman I will be using aloevera to combat hair breakage, tangling and dandruff I just pray it’s effective. Thanks for the writeup. It’s always better to use plant’s extracted pure aloe vera gel as the aloe vera gel from a bottle may have preservatives / additives. If you don’t have plants available then try to use 100% pure aloe vera gel from bottle with least additives………. Maam, will it harm my hair if use natural aloe vera gel which is stored at room temperature for 1 week? how long will the gel stay good if kept at room temperature? You should keep aloe vera gel in an airtight container. The container should be able to keep air and water away from the aloe vera gel. Keep the aloe vera gel at room temperature or slightly cooler for up to two weeks and use for your hair. Don’t subject it to temperature extremes. Can i massage my scalp (without oil) with patanjali aloe vera juice at night and sleep ? Its ok that you apply aloe vera gel 3 times a day without washing it. You can wash your face with plain water before applying aloe vera next time during the course of a day. Honestly I never thought of using aloe vera gel for hair loss. I’ve used coconut oil and avocado oil before, and always thought that aloe vera was used for acne and all skin problems. Looks like I should give this a try as well. Can i apply aloe vera gel after applying oil? Instead of applying aloe vera gel after applying oil, mix the two together throughly and then apply this combo………..
I’ve heard that alovera straightens hair! Is it true? I’ve heard that aloevera can straighten hair when used over a period of time. is is true? Method: Aloe vera is a natural conditioner for hair. Take a 1/2 cup of aloe gel and mix it with a 1/2 cup of warm, not hot, oil. Olive oil works great but you can substitute whatever oil you prefer. Slather this mixture on your hair and wait 30-45 minutes. Wash out and enjoy your shiny, soft, straight hair. I used a homemade steam treatment of coconut milk, onion, carrot,and garlic in my hair. After using it, my hair became very course. Can the aloe vera pre wash treatment and daily spray fix this problem? l love using aloe vera gel fresh from the leaves on my hair. I buy at least 5 leaves at a time and add a different oil to each jar full, and keep one without any oil. Put it in my hair about every other day. My hair wasn’t even down to my ears, but now it’s to my shoulders in less then a year. I shall keep this up because now I know just what I’m putting in my hair, there’s no guessing game with those store bought products. That’s what makes it even better for me. If you can, apply it every alternate day. Nice post dear. I faced severe hair loss last year. Now I want to use aloe Vera to regrow my hair. How should I use it? Do you know any brand of aloe gel or juice that I can use on hair if I am running short of natural gel? Please tell remedy to stop this and for regrowth in hairs.. If you don’t see any improvement, then I suggest you consult a doctor..
Nice post dear. Last year I faced severe hair fall. Now I want to regrow my hair. How should I use aloe Vera gel for this? Do you know any brand of aloe gel or juice if I am running short of natural gel? I bave dull frizzy dry hair I have used aelovera gel on my hair after shampoo but it doesn’t work for me what to do??? Nice article expressed regarding aloe vera. I am using this from 2 weeks. It made my hair smooth and shiny but hair falling increased instead of reducing. I have small garden where I grow aloe but its not eatable nor drinkable (can say “khara”),is this can be reason that my falling of hairs starts gradually, I am so worried. Can I take biotin supplements, want to know which company is faithful from where I can buy Biotin supplements for hair regrowth. You can buy aloevera gel on amazon. Read the reviews of the product on amazon and buy a good product. I am facing hair loss problem these days.. and my hairs are becoming dry .. and shine is almost gone. what should i do? Thank you so much for sharing this. I’ve been looking for remedies for my hair fall. I hope aloe vera can help me with this. Hello Mam, since last few days m having exces hair fall, so I started applying directly d aloe Vera gel on my scalp n hairs n I leave it overnight…so please guide me if its ok to leave d gel overnight as m experiencing more hairfall after dat??? Can I use Fruit of the Earth Aloe Vera Gel 100% for your recipes? This is a very research based informative article. I don’t like any commercial product. So that I always try to use natural herbal remedies for any of my problems. Recently, I have faced hair fall problem. Finally, solve my problem with using fresh Aloe Vera Gel. Actually, I used Aloe Vera Gel and onion paste in my scalp and wait for 1:30 hour. After then wash my hair properly with Anti-dandruff shampoo. It helps me a lot. Thanks for your valuable post. Very useful tips ! But my question is how to get dark eyebrows ? Castor oil is one of the most effective natural ingredient to promote growth of dark, thick eyebrows. It contains protein, vitamins, fatty acids and antioxidants that nourish the hair follicles and promote hair growth. Moreover, it is helpful in preventing any microorganisms that hinder eyebrow hair growth. Soak a cotton swab in pure castor oil and apply massage it gently on each eyebrow for 1-2 minutes. Let it sit for at least 30 minutes or overnight. Wash it off with lukewarm water and a mild cleanser. Do it once every day for few weeks until you see improvement. Stop its use if it causes any irritation or burning. Is it possible to grow hair back on bald spots by applying aloe Vera gel regularly and keeping it overnight? It’s very difficult to grow hair with home remedies once they have fallen off. If you have bald spots, it could be due to alopecia. Homeopathy treatment is very effective for bald spots that have occurred because of alopecia. Does drinking coconut water regularly promotes hair growth? Drinking coconut water regularly is good for overall health. For hair growth you will need to massage the fresh coconut water on the scalp and the hair strands each day. Keep this for about half an hour and then rinse it off with plain water. This can help for hair growth. Thank you mam for your generous reply.Mam can you suggest some shampoos which contains natural ingredients,or which are sulphate free? I think by your name you seem to be living in India. Patanjali has many shampoos that are made up of natural ingredients. Read the labels and choose the one that meets your requirements. Hello mam,I have noticed that my hairs are getting thinner.How to get hair thicker and how to increase hair volume? Thanks For your information. plesae mam,can I know what is the best treatment for 4c low porosity hair? Thanks Xo much For the review. plesae mam,can I know what is the best treatment for 4c low porosity hair? Thanks so much For your reply? I love Aloe vera because it’s rich in amino acids and protein, which is good for a healthy hair, so it’s definitely worth trying out! There is so much good information here. For a range of time saving, natural, time tested and highest quality aloe vera products. I firstly see this.I’m impressed. Pls recommend me pls I’m suffering from hair prb.pls Sir I humbly request u.
Pls if u don’t HV any prb pls cal me Sir or Madam..at my number. 9922053943.I’m living in Pune.Maharashtra. India. You can post your problem here. We will surely help you. Hello mam, all your tips seem to be helpful. I’m planning to use the combination of aloe vera gel and coconut oil before hair wash. But I’ve seen several people complaining about this that it causes severe hairfall. I’m scared that if i use this, will it cause more hairfall? And does this suit every hair type? I’ve little frizzy hair and dandruff. Please suggest me. I’m very interested in using aloe vera. A Great article and full of useful information. This is especially good for me as aloe vera and skin care products made with aloe are my special interest area. I am using natural aloe vera leaf gel as u described above but after washing my hair is have itching on my head I don’t why? it works by cooling the effected area, calming your urge to scratch your head. So, if you are feeling itch on your scalp after using it then try mixing it with plain yogurt (curd) and apply. Hi I already use 1 tsp of onion juice mixed with 2 tsp of oil mixture that I prepared combining olive, castor, almond and coconut oil. Could you please advice if I can add the aloe plant to my hair oil mixture? And in how much quantity? Yes, you can add also 1/2 teaspoon of aloe gel to the concoction..
Also please advice if I can use Aloe vera plant and lemon juice drops as a daily day and night moisturizer? I hope my face doesn’t shine if I wear this moisturizer on a daily basis. Instead of lemon juice, try mixing glycerin, aloe vera gel and rose water and apply this mixture every night and rinse your face in the morning. Should I use conditoner if I am using aloevera before shampooing? Or apply aloevera, then shampoo and rinse hair? Thanks in advance. It depends on your hair type. I suggest that you do an experiment. Just try 2-3 times the way you mentioned above and see how your hair behave. And if you feel that your hair needs a conditioner as well then you start using a condition along with aloe vera. can i wash aloe vera applied hairs with normal water as i dont like to rinse hairs with shampoo? You may rinse with normal water. Using aloe vera will show any side effect on my scalp, as I have never used it on my hairs. I want to get rid of hair loss, will it be beneficial to use aloe vera.